Designer dog breeds are very popular, but the term may have you feeling confused. What does it mean? Are they purebred dogs? Are they mutts? You hear a lot about these dogs but what are the facts? Here is some information you can use if you are considering getting one of these dogs. Using the word “designer” to describe a dog is basically describing a hybrid dog. They are not purebred dogs but they are intentionally bred by crossing two different purebred dogs to get a specific dog as a result. Common and popular designer dogs include Labradoodles, Goldendoodles, Cockapoos, and other dogs that have been bred to try to get the best qualities of both of their different purebred parents. 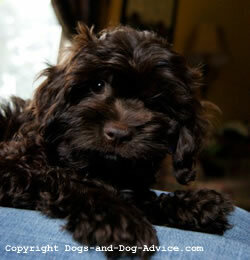 For instance, a Labradoodle is the product of a Labrador Retriever and a Poodle. The goal is to get an intelligent, loving, and obedient dog that will be a great pet, since both purebred parents share these qualities. Breeders try to combine these traits in a dog that will also have a coat that doesn’t shed, or sheds minimally, like the Poodle’s. Labradors are wonderful dogs but they are one of the champion shedders of the dog world. Many breeders of designer dogs have goals such as these: to combine the best qualities in the parent breeds and produce puppies that will fulfill a need. The Poodle is a popular cross as one of the parents in these hybrid breedings for several reasons. They are single-coated and do not shed, so they are great dogs for people with allergies. They can pass this trait on to many of their puppies, though not all. Poodles also come in different sizes: Toy, Miniature, and Standard. This allows breeders to have a choice when deciding what size dogs to try to produce. When breeding to a Labrador Retriever they can breed to a Standard Poodle, for example. In order to produce Cockapoos, which are a cross between Cocker Spaniels and Poodles, they can breed to Toy Poodles and Miniature Poodles to produce smaller dogs. I have had 4 Cockapoos and they have all been great dogs. Low shedders, great personalities and pretty low maintenance. The picture, above, is of our Cockapoo named Cooper. We call him Cooper Dooper, or Brown Lips. The short answer is “No.” Although designer dog breeders try to achieve the positive results mentioned above, not all designer dog breedings turn out well. Some people, even breeders, think that if you cross different breeds you will automatically have “hybrid vigor” in your litters and that the puppies will be healthier than purebred dogs. This is false. Breeding must also consider the individual dogs involved. If you breed together two dogs who have canine hip dysplasia, it won’t matter whether they are the same breed or different breeds. The puppies they produce will likely have hip problems. You can’t breed away from some dog health problems just by breeding to a dog of a different breed. Health problems will still surface. There are some designer dog breedings which are questionable as to whether they should even be attempted. For instance, it’s questionable whether a breed that has numerous health problems should ever be bred together with another breed that has lots of health problems. Breeders should ask themselves whether producing cute puppies is a good enough reason to do a breeding when there will almost certainly be some severe health problems in the litter. That’s an ethical issue, but it is important. Yes, there will probably be people who will buy the puppies, give them wonderful homes, and even provide veterinary care for them. But, should the breeder breed that litter in the first place? Wouldn’t it be better to do a different breeding and try to produce cute puppies that will also be healthy? Designer dog breeds are different from mutts that you can find at the animal shelter. How? The breeder has, ideally, carefully chosen the parents of the hybrid litter and may have had them health tested. Puppies in a designer dog litter are planned. They are not from an accidental litter. The dam is nourished appropriately throughout her pregnancy and the breeder should take good care of the puppies after they’re born. The btreeder should also provide vaccinations, worming, and early socialization for the puppies before allowing them to go to their new homes. Are Designer Dog Breeds expensive? Designer dogs tend to command high prices, often costing more than purebred dogs that come with registration and a known pedigree. It’s debatable whether these dogs should really be priced as high as they sometimes are. You can find a good dog from a purebred breeder, from your local animal shelter, from a rescue, or from other sources for less. But, if you are seeking something new and different, you may be willing to pay the higher prices that go along with designer dogs. If you do want to get one of these dogs, make sure that you get a puppy that is healthy. Ask the breeder if they have done any health testing on the parents, especially for canine hip dysplasia and progressive retinal atrophy (an eye disease). Ask about the health of the parents and other family members. Ask the breeder if they provide any kind of guarantee about the puppy. Will they take it back if a health problem develops? Will they refund any money? Do they provide a contract?